Orientation Day at the girls’ new school! I arrived at the apartment at about 5am, and by 8am we were out the door for an orientation meeting at the Jerusalem American International School. I think the girls will be very happy there! They both had positive reactions to their teachers. The official first day of school is tomorrow. 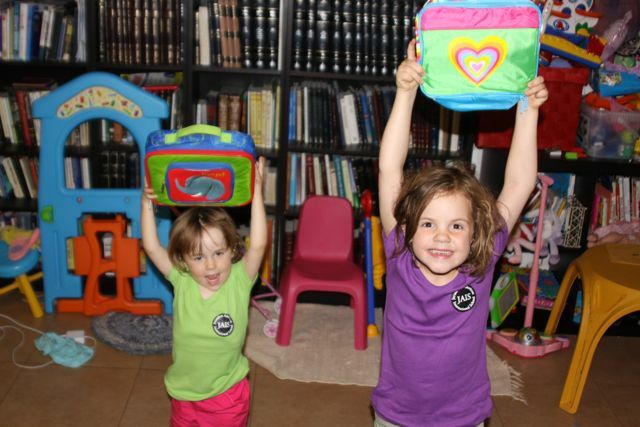 Hilary, my mom and Anne have done an amazing job helping the girls adjust to Jerusalem time. We played in the park in the afternoon and Hilary and I explored our neighborhood in the evening. I had some moments of feeling like I was running in sand – trying and failing to get my cell phone to work, for example, and missing a bus because I was waiting in the shade behind the shelter and it did not see me. There were some successes also – skyping with my bank and getting the wire transfer I needed, done. For the moment, life setup is taking a back seat to the project; tomorrow will be a mix – primarily setting up meetings.